The mission: understand and help behaviorally challenging students in ways that are non-punitive, non-adversarial, skill building, relationship enhancing, collaborative, proactive, and—most important—helpful. In too many schools, those ingredients are still missing. That’s why rates of detention, suspension, and expulsion are still way too high, why schools in nineteen states in the United States still employ corporal punishment, why restraint and seclusion procedures are still employed hundreds of thousands of times in schools every year, and why there are still so many kids who feel disenfranchised, marginalized, disheartened, hopeless, and lost. To bring them back into the fold, we need to find our way to new lenses and new practices. And this needs to be a priority for every school. The task is not made easier by the fact that classroom teachers have been given the very strong message that their job performance and security will be judged by how their students perform on high-stakes tests. While standards are a wonderful thing, the obsession with tests hasn’t been good for classroom teachers or administrators or parents or behaviorally challenging students or any of the other students. But, as you’ll be reading, many schools have accomplished the mission despite all the obstacles. If you’re brand new to the CPS model, many of your assumptions and practices may be called into question by what you read in (these) pages. That’s OK; our knowledge of behaviorally challenging kids has expanded dramatically over the past forty to fifty years, and it turns out that a lot of what we were thinking about those kids—and doing to them—doesn’t square up with what we now know about them. If you’re already familiar with the CPS model, this book will take you further. "Dealing with challenging behaviors? The first goal is to alter your lenses, to understand that challenging behavior is the result of lagging skills. The second is to start solving problems together and teach those skills. Lost and Found is a must read. 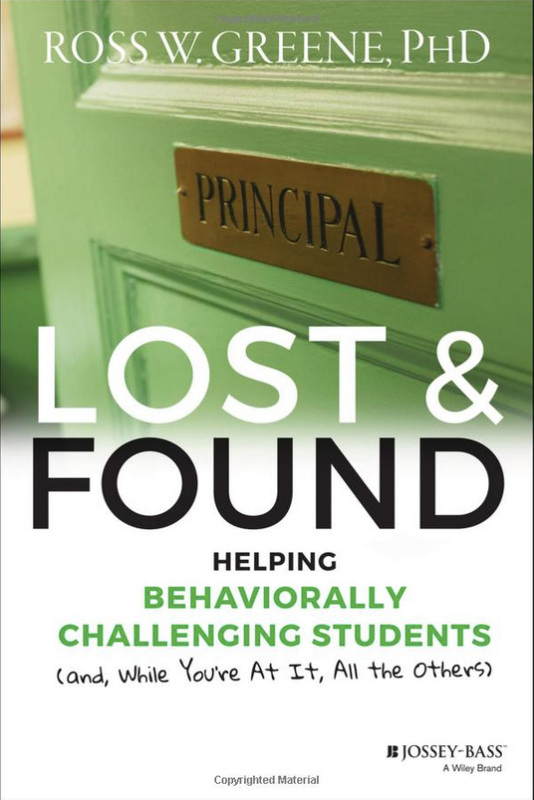 “Lost and Found gives readers lots of examples for how Dr. Ross Greene’s Collaborative & Proactive Solutions (CPS) process works—and how to avoid the pitfalls—at every step of the way. The process he describes is the best way to engage kids and adults in mutual problem solving that, at its core, removes blame and replaces it with respect." The next landscape that needs to be charted for educational change resides in this book. The transformational approach outlined in Lost and Found complements the student achievement agenda for all students. Throughout the book, the voices of educators are a testament to how this simple, research-based process, done with rigor, results in changing beliefs, practices and school cultures. Dr. Greene should be considered a living, international treasure. For anyone who has had the pleasure of hearing Ross Greene talk about how to work with challenging students -- and who has wished that you could bottle him -- here finally is the bottle! He shares in clear prose just how to open the doors to communication and collaboration that give rise to real growth and understanding—for everyone involved in misunderstandings and failed attempts to make change. His approach is so reasonable, so empathic, and so effective that having this user’s guide is a true gift. With no jargon to overcome, and an approach grounded in the common factors of effective counseling, Dr. Greene offers the reader a clear and good-natured map with spirited examples of problems everyone who knows children will recognize. What will surprise you is how simple changes in your own frame can reduce opportunities for disappointment and anger to give way to creativity, discovery, and uncertainty about the future (rather than the certainty of unending hostility and hopelessness). “Lost and Found is an excellent sequel to Dr. Greene's previous work. It clarifies many concepts with which I have seen teachers and other colleagues struggle. I especially liked the comments from educators who have used the CPS model, which provide powerful evidence of their increased ability to problem solve and help even the most challenging students."